‘Tis the season for trotting out Charles Dickens’ perennial story of redemption and family, A Christmas Carol. But before you stifle a yawn, let me quote from a million and one direct response TV commercials: “But wait! There’s more!” Elite Theatre Company Director L.J. Stevens has come up with a production device that is so obvious and logical, anyone in the audience who has ever seen a staging of Dickens’ classic short story might say to themselves, “Now, why didn’t I think of that?” Stevens’ idea is to make A Christmas Carol a multi-media event. Now, if this weren’t such a perfect idea, one might think it was a gimmick to get tickets sold, but in fact, it’s a brilliant and natural concept. 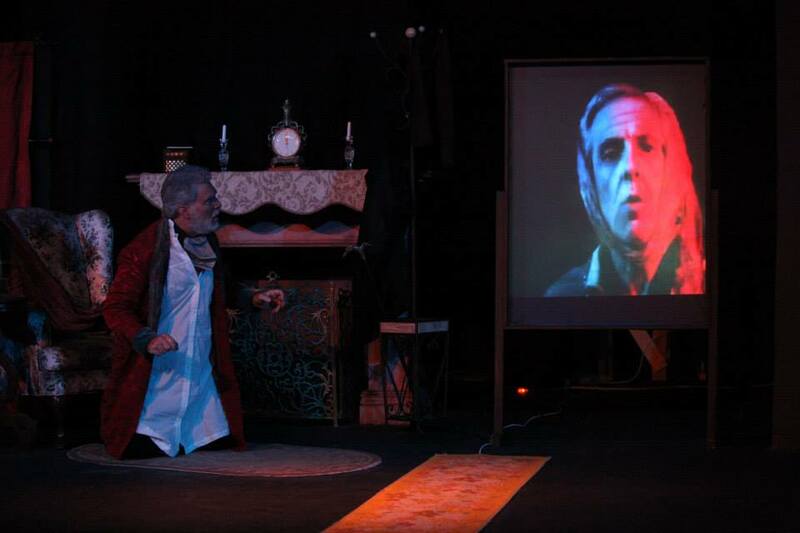 The show, which is appearing at the Elite Theater Company through December 22, mixes live performance with recorded scenes, which are displayed on one of two television monitors located upstage, as if old miser Ebenezer Scrooge had suddenly sprung for a couple of big screens in his bed chamber. During the course of the show, some scenes were projected on the screens; the visions described by the three spirits who visit Scrooge during the night. Through these portals, Scrooge (and we) see “old Fezziwig’s” long-ago Christmas party, specters from Scrooge’s youth, and how Bob Cratchit is managing on a budget of 15 shillings a week with a handicapped child in the house. The use of video also opens up other possibilities, not the least of which is the tendency to crowd the stage with too many props and actors. Not all of the scenes outside of Scrooge’s bedroom were depicted on the screens. It was a wise move not to overuse the device because no matter how well acted or shot, projected scenes are still two-dimensional and tend to drag when compared to scenes with live actors. Also, there is the added problem of timing; when a live actor is reacting or responding to pre-recorded characters, there invariably will be overlapping lines or awkward spaces. These were kept to a minimum, however, and as a rule, the effect went well. Credit Robert Adams for doing a fine job as videographer. As for the cast, live and otherwise, Paul Michael Nieman leads the way with a superlative and powerful portrayal of Scrooge. From his very first appearance, he commands the stage with his presence, booming resonant epithets of “HUMBUG!” to the rafters. Nieman and the first two spirits are the only actors who had to deal with the projected scenes, and handled them well, although Nieman sometimes resorts to grunting and reacting a little too often, which can tend to detract from the dialog on the screen. His transformation from penny-pinching skinflint to giddy philanthropist is remarkable. In the final scenes, he is almost certifiably and insanely happy, sort of like Herbert Lom’s deranged Inspector Dreyfus in the “Pink Panther” movies. Director Stevens gave a spoken foreword to the show in which she presented a possible analysis of what Scrooge was going through that night. Trained in psychology, Stevens opined that Scrooge may have suffered a minor stroke during the night, during which he went through a near-death experience, and that the visits from the three spirits were a form of “life review.” People who have gone through this kind of process often have changes in personality, looking more favorably toward family than material goods, which is the main thrust of the story in the first place. It is rejection of family that has brought Scrooge to the lonely place where he is at the outset of the show. His near-death experience simply opened his eyes to what is really precious in life. Travis Winterstein, who we last saw in Dark Heart of Poe, plays Bob Cratchit with a fine sense of youthful optimism. His crippled son, Tiny Tim, is well-played by young Wesley Umali. As the son and grandson of three other performers (parents Jolyn Johnson and Eric Umali and grandfather Dean Johnson), acting is a family affair in the Umali household. Young Wesley has become somewhat of a theater rat, with more than a half-dozen shows already under his belt. Kyle Cooknick does a great job playing Scrooge’s indefatigably good-natured nephew Fred, who doesn’t care what indignities his uncle hurls at him, he will continue wishing him a merry Christmas. The ghost of Jacob Marley, who only appears on one of the pre-recorded videos, is played by Phil Levere; his performance has an appropriately chain-rattling effectiveness. Many actors familiar to Ventura County stages also made appearances, including Paul Panico (trying to get Scrooge to pinch a few pennies for his charity), Allison Chase Williams (as Scrooge’s one-time fiancee, Belle), Sommer Branham (as nephew Fred’s wife), and Larry Shilkoff and Sharon Gibson, as the jolly Mr. and Mrs. Fezziwig. All perform admirably as supporting players. The three spirits provide Dickensian accuracy to their roles: Kaelia Franklin, looking like a bride, dressed all in white, as the Spirit of Christmas Past, and Drew Davenport, who does double-duty as the Santa Claus-like Spirit of Christmas Present and as an especially frightening Ghost of Christmases Yet to Come. Kevin Kahm was responsible for the effective lighting and sound design while Sarah Solano supplied the period-perfect costumes. A. D. Hasselbring’s adaptation is faithful to Dickens’ original story, but adds appropriate Christmas carols, sung by members of the cast, at opportune times. Even if you know the story of A Christmas Carol backwards and forwards (as most people do), it’s always rewarding to find a production that adds ingenuity and flair to the well-trodden tale. Get in the spirit and come see this show. A Christmas Carol plays at the Elite Theatre Company in Oxnard through December 22. For show dates and times, see the VC On Stage Calendar. Thank you, Cary! It’s so wonderful to find a local performance of this. A Christmas Carol is always a new experience through a child’s eyes (so my 7 year old would enjoy any version), but it’s even more satisfying to discover one that incorporates modern flare for the (ahem) decades-old fan. Agoura High School's Kendall Mordetzky talks about "Godspell"